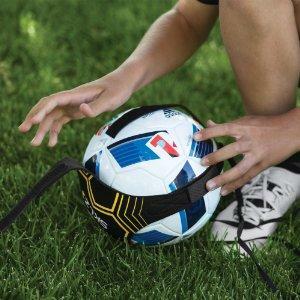 The Hands Free Solo Soccer Trainer gives young players the touches they need to master ball control, develop proper passing and shooting techniques, and improve receiving. Maximize your training by minimizing ball chasing. Fits most players and securely holds size 3, 4 and 5 soccer balls. Train with one of the world’s best. 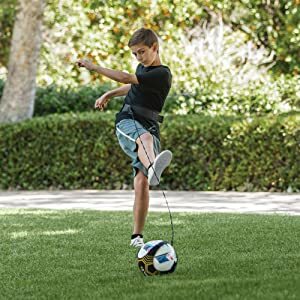 The Hands Free Solo Soccer Trainer gives younger players the maximum touches they need to build their shooting, passing and receiving skills—all without the chase. Holds strong and fits comfortably. 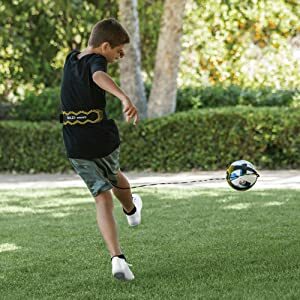 Designed to fit size 3, 4 and 5 soccer balls, its comfortable belt and secure ball glove combine to make it the must-have soccer trainer for all soccer fans. My daughter likes that she can just go to the gym and kick the ball. Love it! Bought this for my 8 year to practice with in our back yard without it flying over the fence every 5 minutes. She works on juggling, juke moves, passing, throw ins- you name it. I love this thing and I'm sure our neighbors do too now that they don't have to return our soccer ball every time he practices. He also gets more practice time with the ball since he doesn't have to chase it every time he works on something. Highly recommend!!! !